Has Iran's influence in Afghanistan changed since the U.S. troop surge in 2010? What steps has it taken in anticipation of the U.S. withdrawal planned for 2014? The Islamic Republic considers the U.S. presence in Afghanistan a major security concern along its 600-mile eastern border. It was deeply suspicious of the 2010 U.S. surge to dislodge Taliban forces from southern Afghanistan. Iranian leaders are now more concerned about a residual U.S. presence—albeit in smaller numbers—after 2014. On January 11, President Hamid Karzai visited the White House and announced that coalition forces will transition to a support role this spring. Tehran is keeping a close eye on the Bilateral Security Agreement under negotiation between Kabul and Washington, and actively trying to influence that debate inside Afghanistan as well as at the regional level. Iran’s influence since 2001—when it supported the U.N.-backed effort to topple the Taliban and establish a new political order—has gone through different phases. It used mainly soft power to strengthen its foothold in Afghanistan through investment, trade and cultural linkages. Over the years, Iranian security and intelligence institutions have become increasingly active in prodding a Western withdrawal and shaping Afghan politics. What are the key issues on which Afghanistan and Iran agree and disagree? ● Narcotics: Iran is not only a transit point for the Afghan narcotics business, but also a major consumer market for opiates. The United Nations estimates that the Islamic Republic has 1.2 million drug addicts but others think there could be millions more. Iranian forces crack down on the drug trade by fighting heavily armed traffickers and patrolling the border. Tehran claims to spend $1 billion annually on its war on drugs. Iranian leaders critique the Afghan government and its Western allies for failing to cease the cultivation and production of narcotics. ● Refugees: Iran is increasingly politicizing the presence of illegal Afghan workers and refugees, estimated at more than one million. Authorities have reportedly mistreated Afghan refugees and deported thousands since 2007. Kabul is increasingly frustrated and resentful of Tehran’s policy toward refugees. 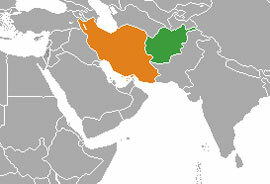 The U.N. estimated that Iran deported 711 Afghan refugees per day during the first half of 2012. But nearly all of the deportees were single males who entered illegally to find work. ● Water sharing: While Afghanistan and Iran have a comprehensive treaty on the Helmand River water rights dating to 1973, there are tensions about the lack of verification and enforcement of the flow of water into Iran. The Kamal Khan Dam, which regulates the flow of water to Iran’s Sistan Balochistan Province, is a source of animosity on both sides. ● Cultural and religious influence peddling: There is increasing unease in Afghan political and cultural communities about unregulated Iranian funding of cultural, media and religious activities in Afghanistan, mainly to the Shiite Hazara, an ethnic minority. The Taliban systematically killed and displaced thousands of Hazara before 2001. Over the last decade, Iranian relief organizations and businesses have reportedly funded construction of houses, libraries, roads, schools and clinics in several Afghan provinces, including Herat. ● Trade, investment and currency: While both countries are in favor of expanded economic and business ties, the Afghan economy’s weak base has mostly benefited surrounding countries, including Iran. It has flooded Afghan markets with low-quality goods. The trade imbalance is further compounded by heavy Iranian investment in western Afghanistan. Iran has also destabilized Afghan markets by purchasing large amounts of foreign currency, a counter-measure against international sanctions on its nuclear program. What influence does Tehran have on President Hamid Karzai and his government? Officially, Afghan-Iranian relations are portrayed as normal and friendly. Afghans express appreciation for Iranian assistance against the Soviets during the 1980s and against the Taliban during the 1990s. However, tensions simmer under the surface, especially about the treatment of Afghan refugees in Iran and, more recently, about Iranian agents fuelling parts of the armed insurgency. Hamid Karzai, weary of Pakistan’s meddling in favor of the Taliban over the years, has attempted to maintain a more balanced approach toward Iran. He likes to portray himself as a nationalist president rather than a U.S.-supported leader. He has also taken into consideration Iranian recommendations, accepted Iranian aid, unsuccessfully tried to be a broker between Iran and the West, and avoided rattling relations with Tehran on contentious bilateral issues. What is Iran's vision for Afghanistan's future? What are its goals in the short term and long term? Iran’s vision for Afghanistan and its own role is in flux and now tied to other factors, such the nuclear standoff, the Saudi Arabian and Arab dynamics, the U.S. presence post-2014, regional alignments and rivalries, the state of its economy and domestic political stability. It would prefer not to have to be concerned about Afghanistan. To this end, it is focusing on carving its sphere of influence, accelerating a Western withdrawal, and assuring that its interests are protected. Iran is probably not in favor of a Western-influenced , democratic, affluent Afghanistan, but at the same time, is concerned that an unstable, opium producing and radicalized Afghanistan can also pause a major threat to its interests, as experienced in the 1990s. Torn between these two conflicting scenarios, and taking into consideration all other factors, it will try to prioritize its strategic and security needs in order to influence the course of events to the best of its abilities and given the resources at its disposal. Omar Samad, President of Silkroad Consulting and previous Senior Afghan Expert at the United States Institute of Peace, was Afghanistan’s Ambassador to France (2009-2011) and Canada (2004-2009).